See the symptoms of SAD disappear with the new sleek and sophisticated Valkee 2. Valkee is a revolutionary treatment which uses high intensity light therapy to alleviate Seasonal Affective Disorder (SAD) within just 4 weeks. It looks just like an mp3 player with earbuds which direct the light down your ear canal and directly to the photoreceptors in your brain. The treatment Valkee 2 provides is far more effective than traditional SAD Lamps which are designed for the sufferer to sit directly in front of for up to an hour every day. With Valkee 2 treatment time is far quicker at just 8 minutes each day. SAD is caused by a lack of light during winter months. Natural light is essential for a good mood, as it is responsible for creating healthy levels of the feel-good hormone serotonin. During winter the days are much shorter and our exposure to natural light is dramatically reduced as we tend to travel to and from work in the dark and spend most of our time indoors at work. As a result of this our brains lack serotonin and we begin to feel depressed; this is Seasonal Affective Disorder. Symptoms include mood swings, anxiety, feeling reluctant to socialise, craving fatty and sugar foods, lacking energy and motivation and generally not feeling like yourself. Symptoms can vary from person to person, but for some people the condition is so severe that it becomes completely unbearable, and can occur from early October right through until late March, every single year. Rather than treat SAD with antidepressants doctors recommend their patients use light therapy, and with Valkee 2 it couldn’t be easier to get your daily dose of light to lift your mood. In a clinical trial conducted in 2009 92% of SAD sufferers who tried Valkee reported a dramatic reduction in their symptoms within just 4 weeks when using the device for 8 minutes each day. Some satisfied Valkee users have even reported that their mood lifted after just one use. 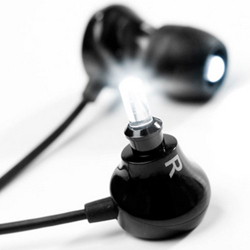 Valkee 2 is a new and improved version of the original Valkee Bright Light Headset. It is carved from a solid block of aluminium, making it hardwearing and durable whilst remaining super lightweight and portable. The headset is now detachable, the earbuds have been ergonomically redesigned for optimum comfort, and the control button lights up to display how treatment time is left. Plus, the device looks utterly sleek and sophisticated. So don’t put up with your dark mood every winter; try Valkee 2 and get back to your happy, normal self.